What does Pythagoras have to do with architectural design? Some say that architecture begins with geometry, and as it turns out, geometric design was founded in Pythagoras’ general principles around symmetry and balance. It’s a creative way to mix shapes, lines and curves together for a simple, yet beautiful effect. As one of the leading design trends in 2017, it’s clearly here to stay. In this article, we’ll be going over ways you can incorporate geometric design into your home today. 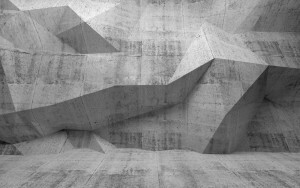 Rooted in mathematical principles, geometric design is often created with formulaic precision, though there are also more experimental options available.. Put simply, it is the fundamental science of forms and their order. In architecture, geometric design is based in ideas around proportions and symmetrical elements that come together to create harmony. While there are often no fixed rules with architectural design, it can be incredibly helpful to consider space, structure and form to arrive at a well-formed, geometric design solution. As the Roman architect Vitruvius believed, ‘without symmetry and proportion no temple can have a regular plan’. How Can You Use Geometry In Your Home? From the ancient Egyptian pyramids, to the Empire State Building in New York, geometric design remains a key element of these iconic architectural feats. One of the best way to incorporate this concept into your home is by introducing geometric patterns into floors, walls and driveways. For an especially striking design, choose coloured stone or concrete and ensure that the pattern is highlighted by creating contrast between the different materials. Another way to create interest, is by choosing a particular style of cut for your materials; stone tiles will appear differently depending on the cut, and this will impact design. Because geometric design is often used to create seamless patterns, it can be incredibly useful to bring a sense of balance to any design. The team at A Better Driveway are specialists in decorative concrete solutions, offering a wide range of colour options at affordable prices. Get in touch today on 03 9308 6112.